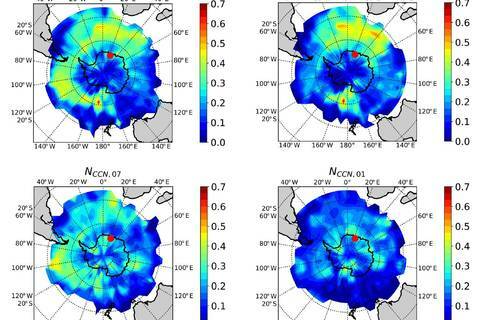 Assessment of the anthropogenic influence on CCN in the pristine areas of the poles. 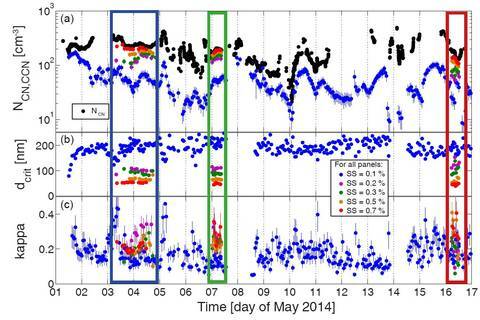 Activation measurements in the field are carried out with a so-called cloud condensation seed counter (CCN -100, DMT , Boulder, USA ( CCNc ), Roberts and Nenes (2005) ) following the ACTRIS standard operating protocol (SOP). 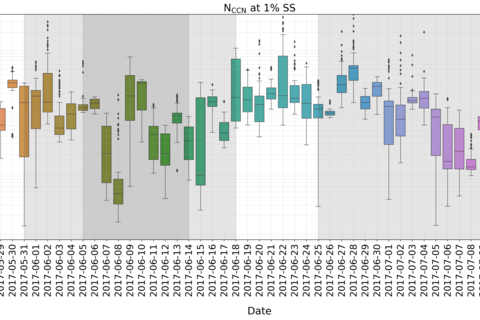 At most stations this instrument is used as a stand-alone instrument to determine the total number of CCN at supersaturations between 0.1 and 1.0%. 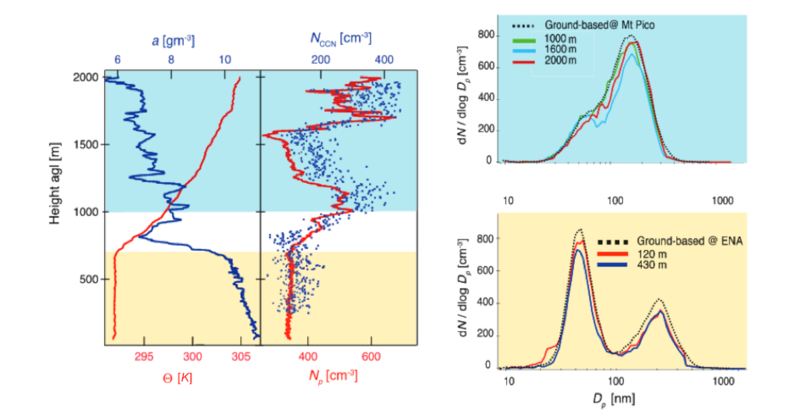 Knowing the number size distribution of the entire aerosol population, one can draw conclusions about the hygroscopic properties of the CCN from such measurements; often given in the form of the hygroscopicity parameter kappa. The CCNc can also be used in combination with a DMA for monodisperse activation measurements. 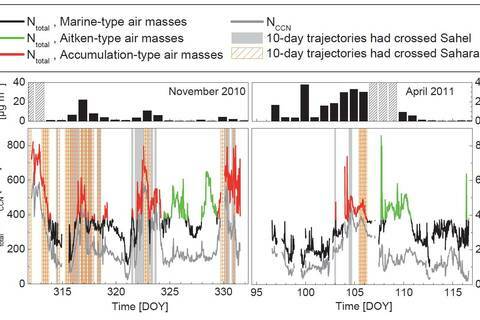 Thus, both the aerosol number size distribution and the number distribution of cloud condensation nuclei at a certain supersaturation can be determined. 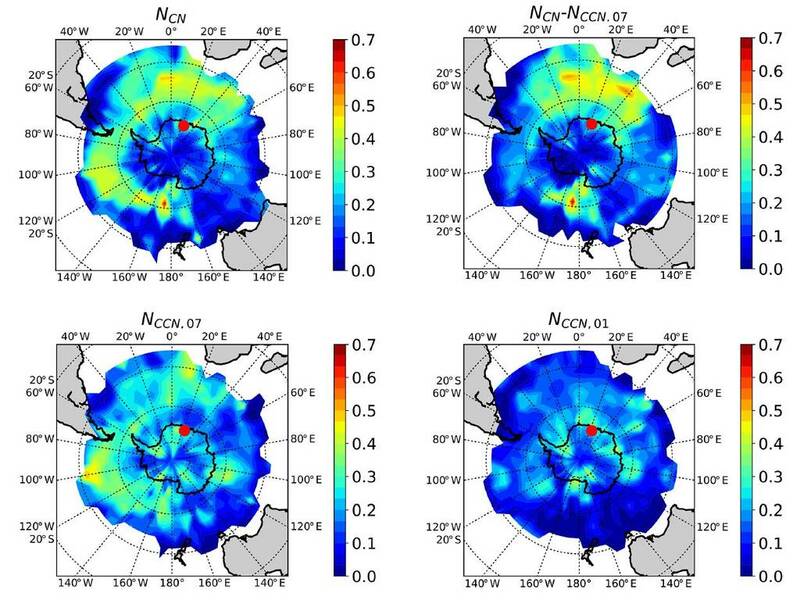 PS106 Polarstern cruise, Arctic CCN: the farther in the ice (grey pack ice, dark grey ice station) the less local sources and the lower the observed CCN number concentration. 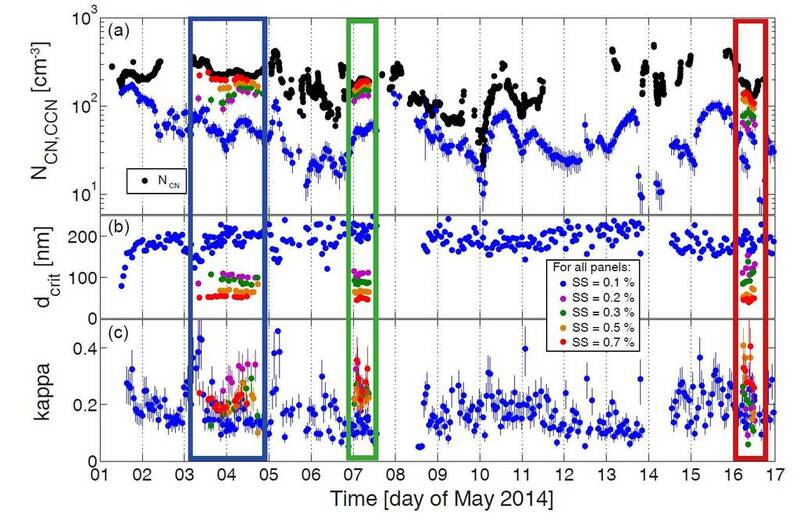 Northern Canada, Tuktouyaktuk, May 2014: Different air masses had similar kappa values. 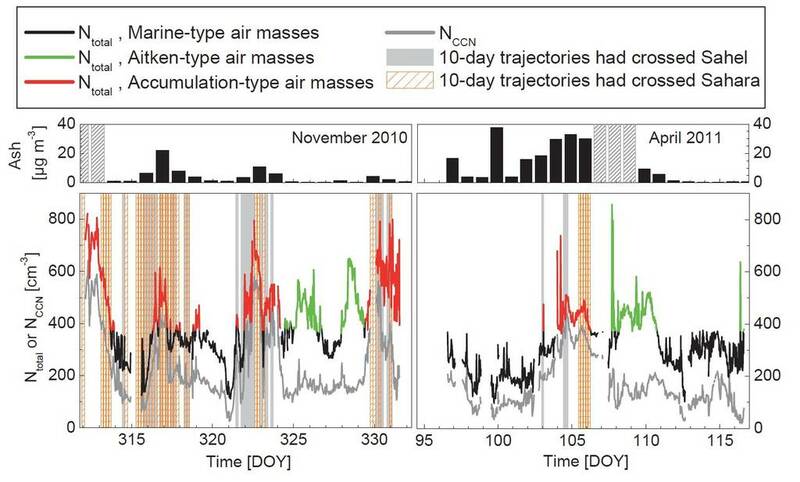 Up to altitudes of 1200m, the air masses were comparable to those on the ground, unlike above 2000m, which indicates long-range particle transport at these altitudes. (Details in Herenz et al., ACP, 2018). 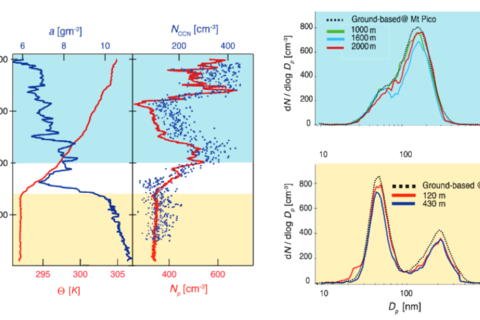 Ground and airborne measurements on Barbados: Three different air masses were observed: clean marine air masses, marine air masses with pronounced particle formation and air masses from Africa (Sahel, rarely Sahara). (Details in Wex et al., ACP, 2016). 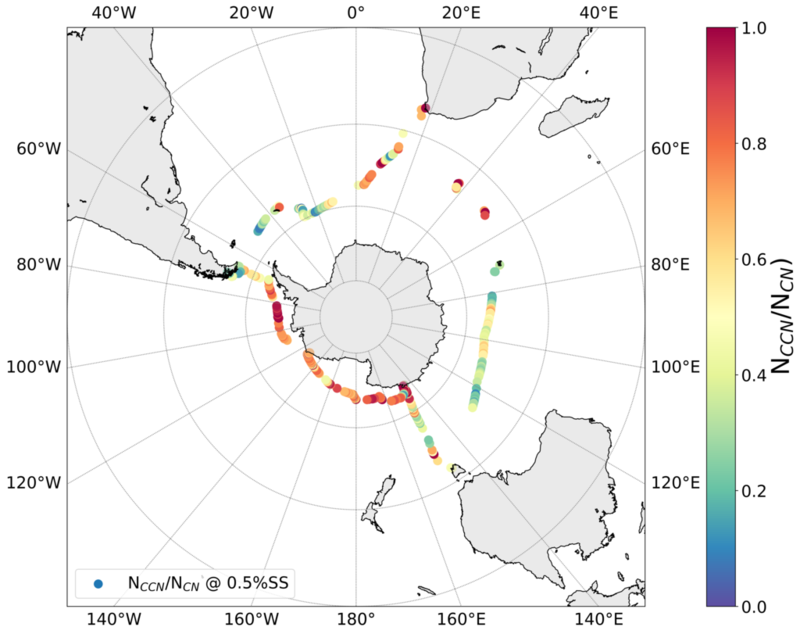 ACE-SPACE project: in-situ CCN measurements along the entire Southern Ocean, comparison with global models (GLOMAP) shows that these underestimate the CCN number (Schmale et al., BAMS, submitted). 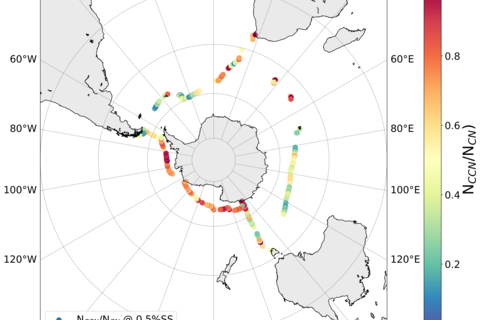 Princess Elisabeth Station in Antarctica: The aerosol is Aitkenmode-dominated, particles from new particle formation grow up to the size range of CCN and the Antarctic continent itself does not act as particle source. (Details in Herenz et al., ACP, 2019). 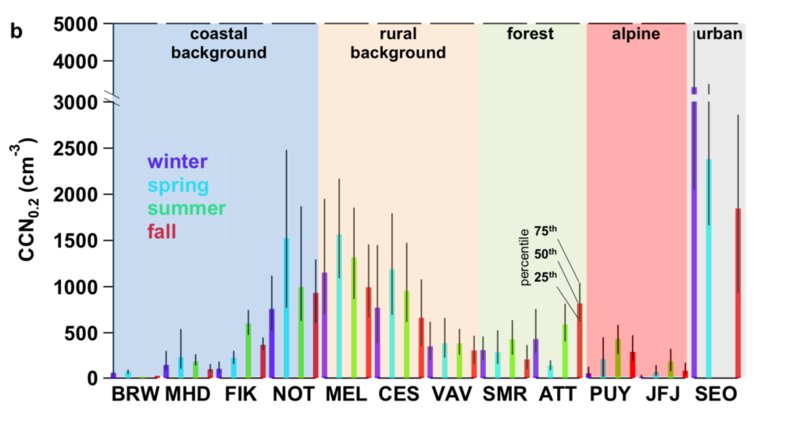 Ground-based CCN measurements (August 2012 to June 2017 continuously and campaign by campaign) at the TROPOS Melpitz measuring station, whose values are available within ACTRIS (Schmale et al., ACP, 2018), show an annual variation both in number and in particle hygroscopicity. 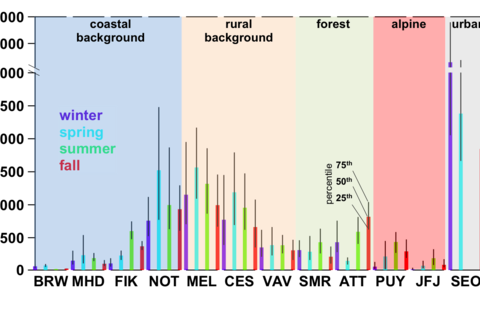 Height profile of CCN measured with ACTOS during the ACORES campaign; first case studies show different CCN layers, similarly structured to the total aerosol.